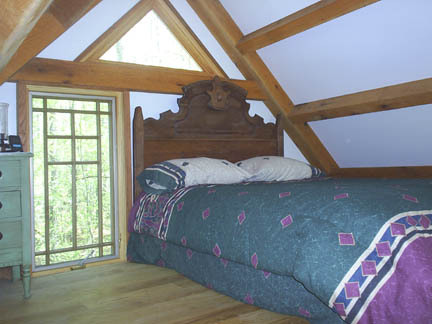 There are lots of windows that bring the outdoors inside. 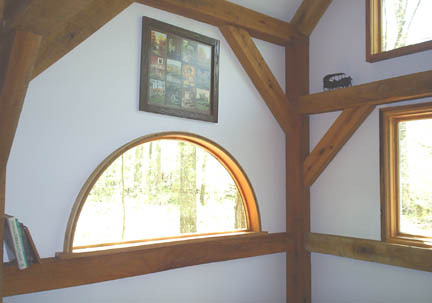 When you are sitting within the timber frame you feel a very strong connection to the trees right out side your window! 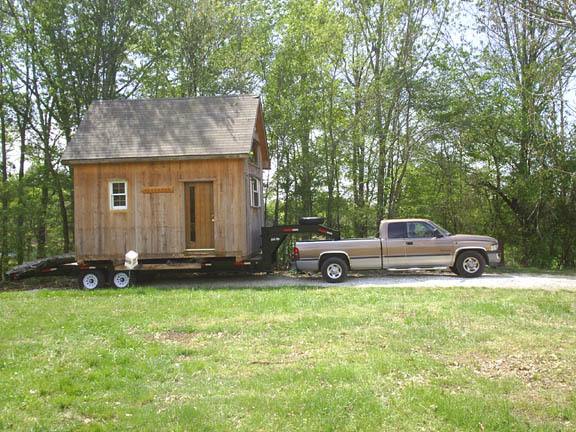 I do not think this is what Laura Ingalls had in mind, moving the entire "Little House". 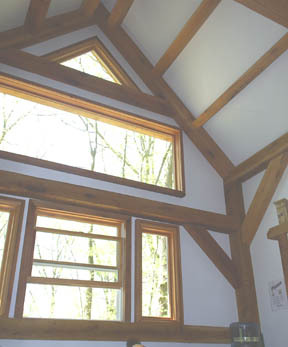 This timber frame was my first timber frame that I cut on my own. 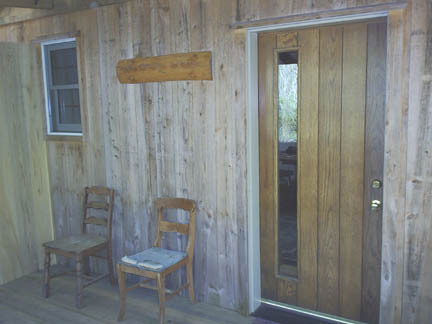 I used only a circular saw, 1/2" drill and chisel and mallet. 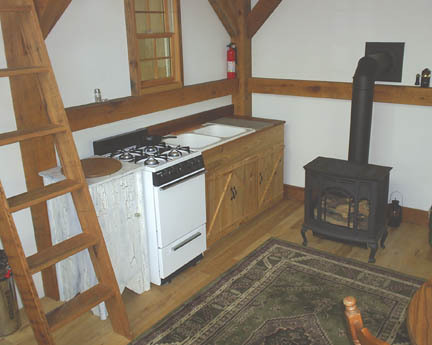 This timber frame started out as "The Little House in the Little Woods" and we have some great memories from it being there. 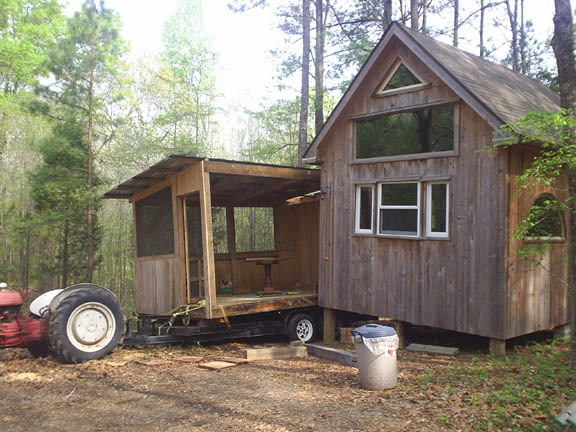 Due to repeated vandalism, I decided to move it closer to the "Big House by the Little Pond". It was quite an adventure on the moving day that it went from the woods to the pond! 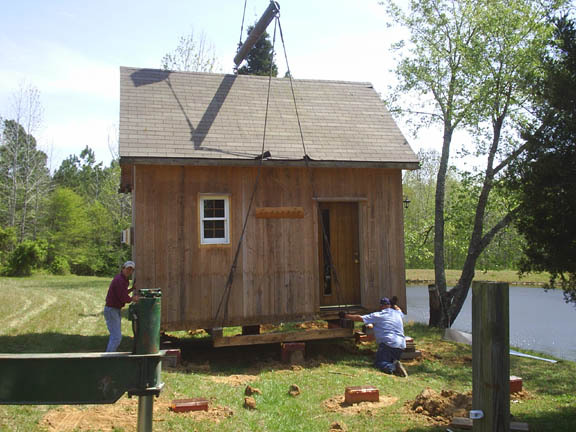 The following photos are of the moving day of the "Little House". It went relatively smoothly except getting the 40 ton crane stuck in the woods. When on the first attempt by the tow truck to pull out the crane and the tow truck almost turned over, I became a little worried as time was clicking by and I was renting the crane by the hour! The tow truck driver made some adjustments and the rest of the day was successful! 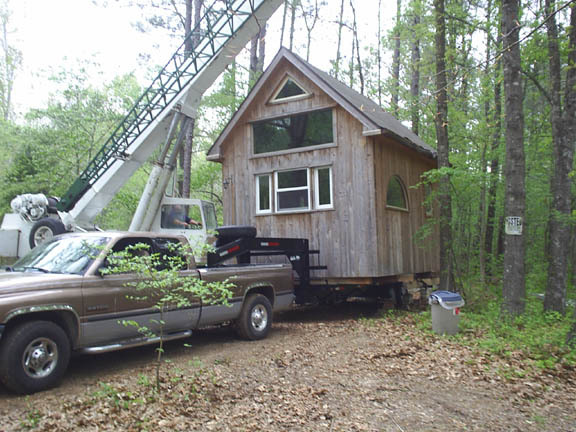 I moved the porch myself before the crane arrived. 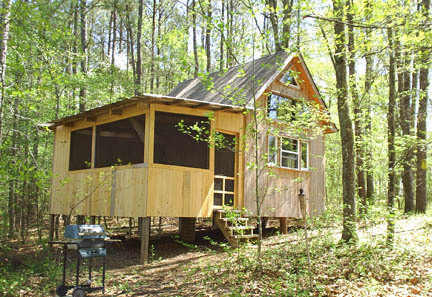 Crane lifts up the timber frame and I back my trailer underneath. 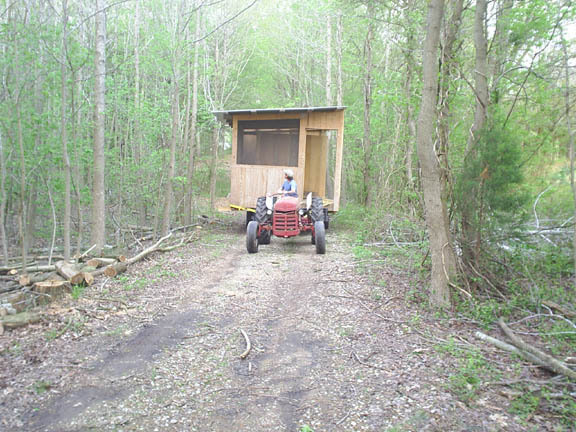 Mobile "Timber Frame" Home!! 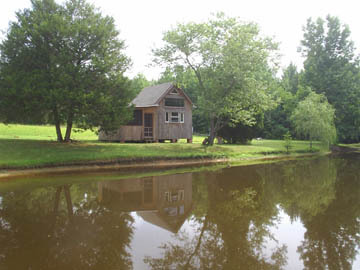 Slowly, I proceeded towards the new site for the "Little House" by the pond. The crane sets the timber frame on its new foundation. 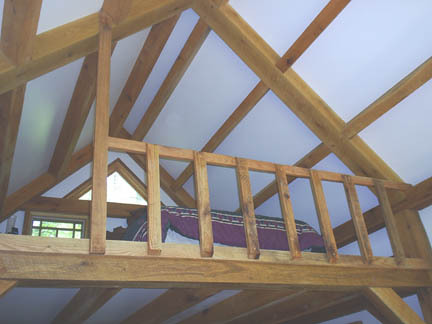 To realize the strength of oak timbers this entire timber frame was lifted entirely by using 2 - 6" x 6" x 18' oak timbers, which are relatively small timbers. 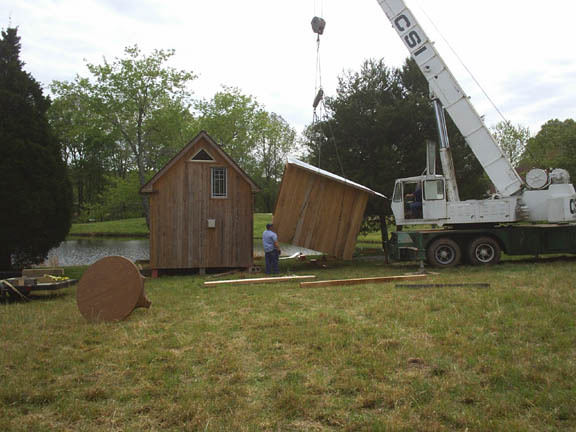 The crane operator estimated that the cabin weighed at least 20,000 pounds. The last step for the crane, setting the porch into place. "Now fear the Lord and serve him with all faithfulness... But if serving the Lord seems undesirable to you, then choose for yourselves this day whom you will serve,... But as for me and my household, we will serve the Lord."